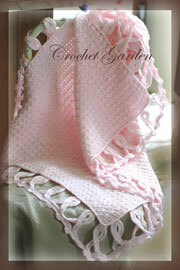 First, the Crochet Garden now has its own official page on Facebook!! Many announcements (including tutorials like this one) will be announced there. 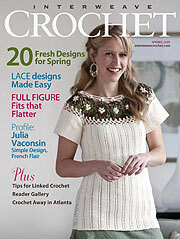 Check out the Crochet Garden Facebook Page! 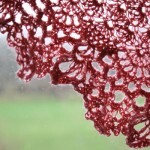 Since I started designing lace shawls, I have come across discussions on blocking. Now, I do not say this is the best and only way to block. I only say this is the way I do it. 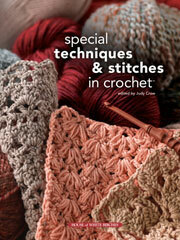 This is also for both crocheters and knitters alike. I pretty much learned blocking as a trial and error kind of thing, and I will discuss with you what worked for me and what didn’t, and why. I hope this helps you. Some of the points you may agree with and some not. Please let me know what you think as this will only help everyone and even me! First, why is blocking so important? 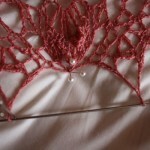 In some patterns it plays a large part in how the project turns out, namely, lace patterns. 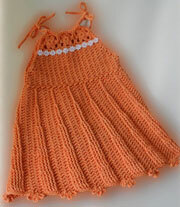 In some crocheted garments, it is mostly evening out, and if gauge is off a bit, to stretch out just a bit to the correct size, etc. 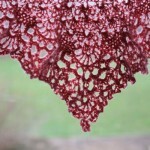 But with lace, this is when your shawl comes alive. A little bit of magic happens. 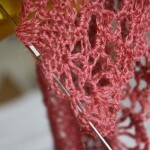 I have noticed when crocheters are making their first lace shawl, they are tempted to use a very tiny hook (due to the nature of the crochet beast – lace being so fine) or a large hook, because they are dismayed their work in progress is not looking like the finished project. 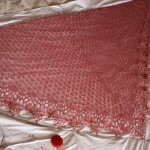 As you see with the Dahlia Shawl; which was most recently published in Interweave Crochet, spring issue of 2011, look at the unblocked photo. Notice how bunched up the stitches are. It does not have that open airy feeling of the other photo. Closely look at the edging. The unblocked photo, the stitching looks so much thicker and dense, not as flowing and almost translucent as the blocked photo. 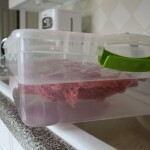 Gently take a tub (you can even use your bathtub) or any container, and fill with water. I always use lukewarm to room temperature water. 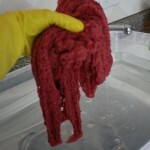 Gently place your lace into the tub with the water. Do not agitate your work. It could felt up on you. Gently press down the work in order to immerse it. 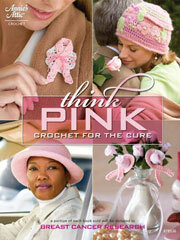 You will see little bubbles come up, and that the air coming out of the yarn. During this time, do not be tempted to stick your hand in and feel it. 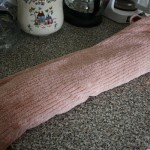 You really do not want to move it once it is in an soaking, especially if made of wool. 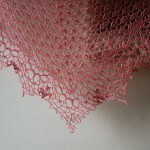 The yarn is just so delicate and fragile, and you do not want to chance any tearing, or making weak spots in your work. Just let it be. 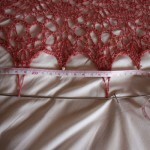 Step 2: Remove lace from tub- have towel ready. Ok, next it is time to remove the shawl. Be sure to have some towels ready. Gently remove (with 2 hands- my excuse was holding camera) from the tub and place within towel. 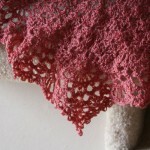 I like to wrap up or roll up my lace within the towel. 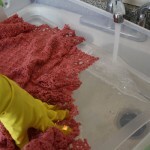 You do not want to wring or twist your work to get the water out! 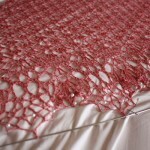 I simply role mine up without adding any friction, and then apply pressure to the rolled lace while enveloped by the towel. 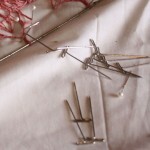 Insert blocking wires by weaving them in and out of stitchery every inch when there are not definitive outer points. If you do not have blocking wires, I would recommend getting them. Do not skip reading this and Step 4, as it is still important. 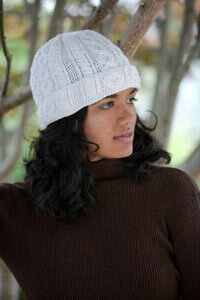 Blocking wires help with symmetry and getting that professional, extreme beautiful look. 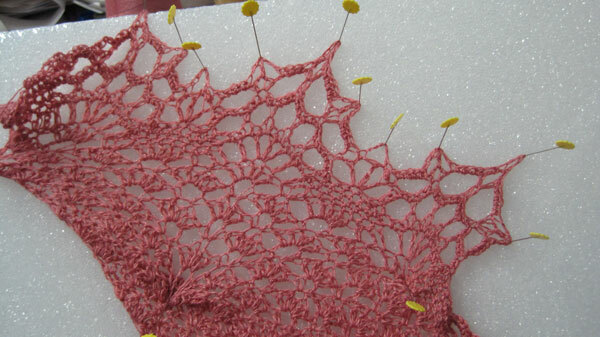 When there are definite points, like in the edging along the two sides where the bottom center is, then you will want to insert wire from front to back or from back to front at same place in each point. Always keep things consistent when blocking.If you do not have wires, then place regular pins, every inch, or at every point, and use a yard stick to make sure it is level/straight. 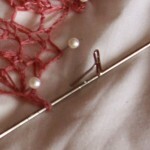 Step 4: Use T pins to straighten your wires. 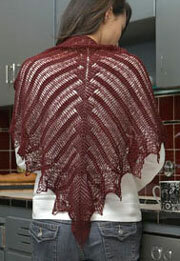 This is the part where you spread the shawl out. T pins are used to anchor your wires. You will need something sturdy to push them into. In this example, I used my bed. There is however a multitude of things you can use. The most important thing is making sure it is strong, and you can pin into it without the pins moving. When I first started, I bought a ton of those rectangular pieces of Styrofoam. They were not that practical and easy to work with, but they did the job until I discovered the bed. But now, I use mats. They are like those foam ABC mats that look like puzzle pieces for kids. They work beautifully. I will have to get a photo later of it (sorry). One tip I can give, is that your work will be wet, and thus your bed soon will be as well. You may have to use the water bottle and spray it down some if it starts to dry out. If doing this on a mattress, or anything else really for that matter, put down some sort of waterproof barrier. 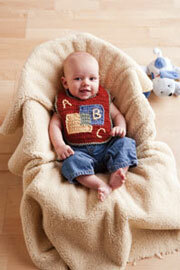 For the bed, you can get one of those toddler bed covers that are waterproof. You can also use plain old garbage bags. Just cut them open to take advantage of the surface area. For my mats, I use a sheet. The mats are pretty good at taking dampness. 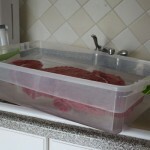 I would put something over the waterproof barrier, only because the water from the bottom will pool there. I usually use a cotton sheet, which seems to work pretty well at giving me that level wetness I desire. Anyway, you want to have as many T pins as needed to keep the wires straight. 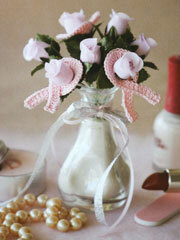 I have found these at my local store in the sewing section, as I did not get enough with my blocking wires kit. I also, depending on the pattern measure my distance between points. 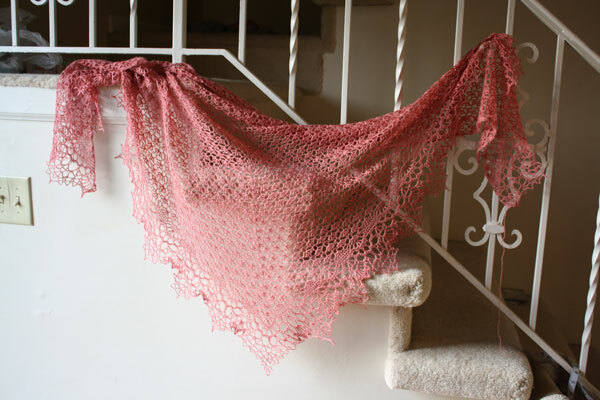 Now, there are some people who recommend folding the shawl in half along the vertical axis, lining up the edging from each side, and pining while folded. I have tried this and do not recommend it. This by the way was my second time blocking. The first time I tried the folding method, and it did not turn out well. I could not stretch out that center, and a vertical shading appeared right down the middle (you can see this in the photo). If you think about it, this possibly could be prevented by having the wire inside the fold, held together with T pins, and then stretched out by the edging. But because of where the pressure points of stretching are, they will not be the same near the center as they are in the Body, so I would still see this having a chance of happening. 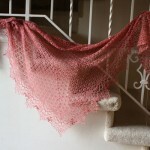 I find laying the whole shawl out prevents this entirely. 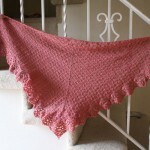 I now use a meter stick to make sure the scallop on one side is level with the reflecting scallop on the other side of the shawl. And also, I use a tape measure to make sure the distance between points is the same. 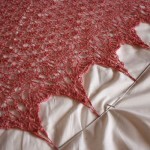 There is hard blocking and soft blocking, and I suppose every kind of blocking in between. These are terms I refer to the types of this process as. There may be some technical term for it out there somewhere, but this works for me, and hopefully for you too. 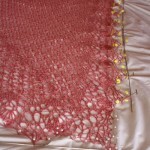 A hard blocking would be where you really stretch out the projects quite a bit from its initial measurements. I know quite a bit if subjective. 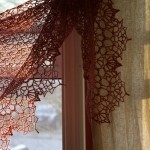 But you will see how the lace relaxes. Stretch out all sides 1/4 of an inch. Not much happens right? That would be a soft blocking. Not much happen, or only a little happens. 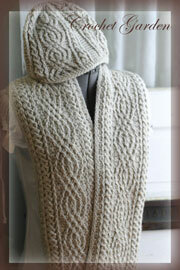 Many times a super soft blocking would be used to straighten out a garment to match the schematic perfectly. Now keep stretching and stretching and stretching- magic happens. It really opens up a lot. I think this is where a common misconception occurs. I have seen many crocheters going up a lot in hook size as they are puzzled why their work is not looking like the finished piece. More on this later, with before and after photos to show the magic. If your edging consists of scallops, or some sort of valleys or hills, always start out and work your way in. So first pin the outermost point that you can see. 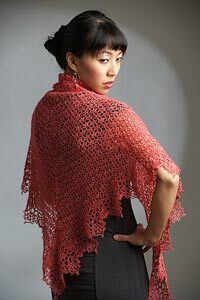 Then work your way toward the body of the shawl. Step 5: Begin Pinning! This is where the fun, or maybe torture begins. I usually have at least 2 containers of pins- I just never know how many I will need. I like to use the long strong high quality pins. It just makes life so much easier- and well when I can spoil myself with little things, I indulge! Yeah I get excited seeing pins in the store. I especially like the little ones with the flowers on the head! Now, when you grasp a point, where you pin, is there it will stay. Here is a tip- and also will work with the T pins. When you go to pin, put the pin in at an angle away from the work. 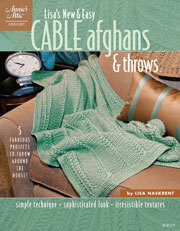 This will help keep wires in place, as well as the points where you want them to be. Note: Wherever you pin, is how it will be. The work will relax some, but not much. So you want to be sure every point is even. If you get tired, take a break. Get a spray bottle and re-wet it later. Take your time, and do it as perfectly as you can- the results will be worth it. Every place you put a pin, that is where that specific point will be. Use the yard stick to check for symmetry and evenness. 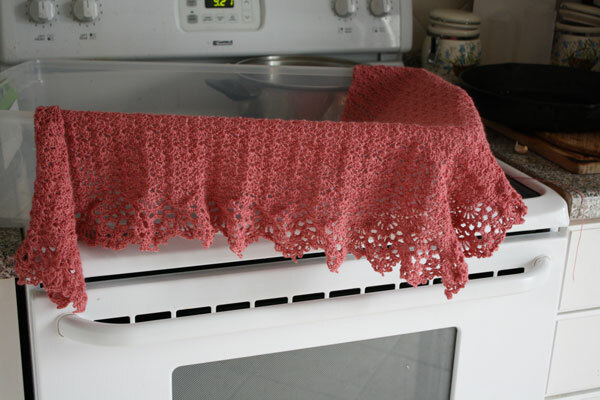 If you find while blocking – as this could take even 4 or 5 hours, that your shawl is drying out, keep the spray bottle going. I allow my piece to dry for at least 24 hours. Sometimes it is hard to tell from the touch if it is still wet, because it does tend to be cool. Just do your best and unpin a little. If it retracts greatly, then it needs more time. 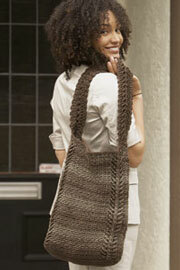 Before I brought up about a common error crocheters make is switching to a significantly larger hook. 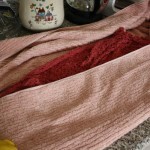 They often feel there is something wrong because their garment is not turning out like the finished picture. 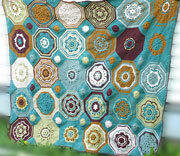 This is a whole new world- this blocking madness, or divinity I may call it. 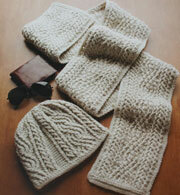 Something really magical happens when you mix fine yarn, wool and blocking. To make that fear subside- that your project is not going to turn out like it should, try this. When working your project, do not fret that it is not turning out like the finished project. Grab some Styrofoam, or even use your bed mattress, and grab some measuring tape, and do a dry mock blocking. See what it looks like. 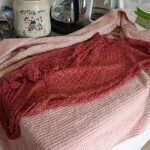 This is the magic of blocking. This is the sparkle of wool. 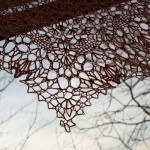 This is the whole new world of lace. Now go make some magic happen! 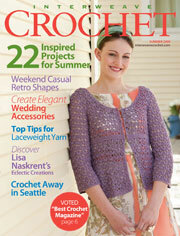 Petit Fours – Published in Simply Crochet Issue# 43! 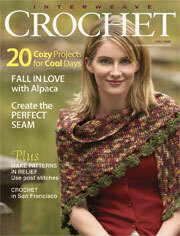 Stop 93 On The Crochet Express! 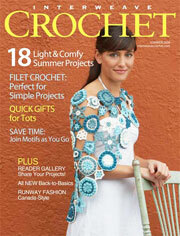 50% Off New Seaside Girl Crochet Pattern! 20% Of Any Order In My Etsy Shop! 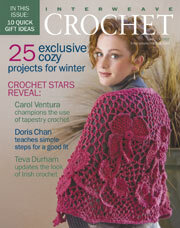 Inspiration Stole – Published, Interweave Crochet 2012! 2017 NatCroMo Blog Tour, March 6: Lisa Naskrent – Crochetville on NatCroMo Blog Tour 2017! 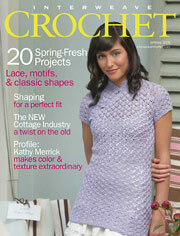 Interweave Crochet A resource of articles, patterns, magazines, books and more- all of high caliber. 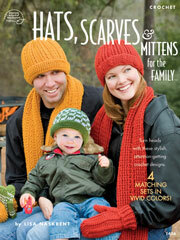 Annie's Attic A resource of patterns, magazines, books and other crafts, including knitting. 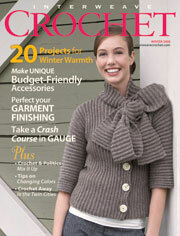 Crochetville A busy forum for crocheters and designers! Where your hook comes alive! 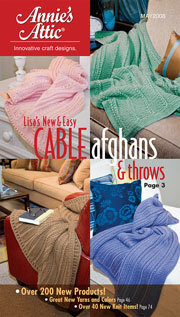 Lisa Naskrent firmly believes, where there is a will, there is a way. First and foremost, one must be charged and have passion… Then, anything is possible. 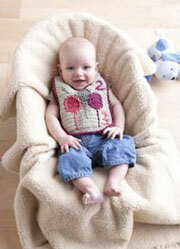 "Bustier Top and Rainbow Rolls"
"Snuggly Hoodie and Simply Bibs"